Many people don't realize that white canvas tarps can be a great protective measure to use over vehicles and other items that are outdoors. They are more useful in protecting items outdoors than any other color and are sturdy enough to withstand a lot of abuse. 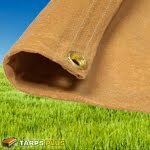 Tarps come in a wide range of sizes and shapes, as well as colors, so what makes these ones so special? There are a few reasons, including the fact that white canvas tarps is an ideal type of tarp for covering most items such as bikes, motorcycles, boxes and crates. White is the perfect color since it actually reflects heat and light. That means it works to keep your items safe and secure. Where a black tarp could cause things to heat up too much, white will keep it all much cooler. This is good for things that are not meant to handle a lot of heat and can be a good investment. You can always use a tarp. As a covering, they can't be beat, so it's handy to have extras around. You can fold tarps up quite flat or even roll them so they don't take up much space at all, making it very simple to keep a number on hand for any occasion. Many people like to keep canvas tarps on hand in their vehicles, as well as near their home. You can use tarps for spreading out under projects, as well, so you can avoid losing small pieces that belong to the items you are working on. While any color will do the trick, keep in mind that white canvas tarps are ideal for protecting your belongings from the elements and the sun. They will help prevent heat damage and can be stored easily when not in use, making it easy to keep extras around.